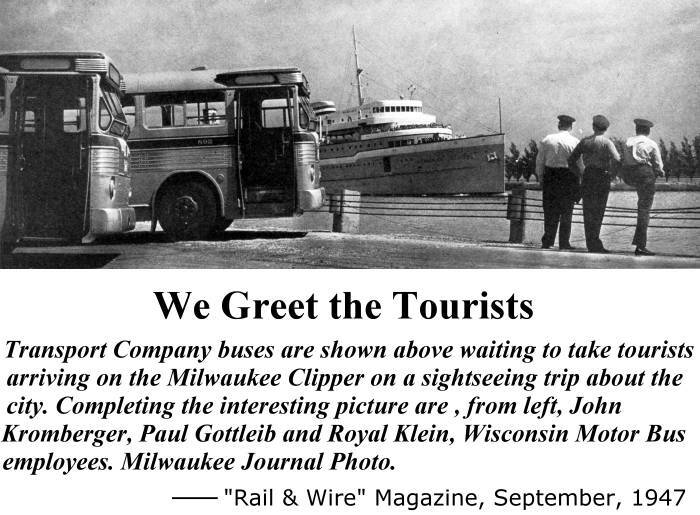 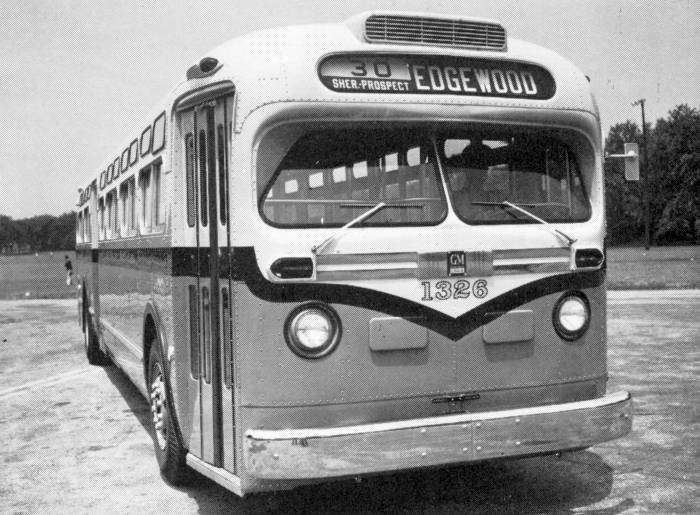 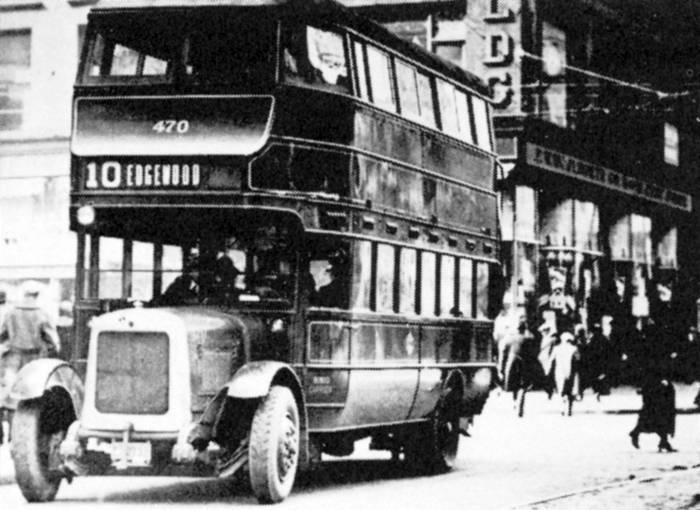 The Milwaukee Electric Railway and Light Company began offering motor coach service in 1920. 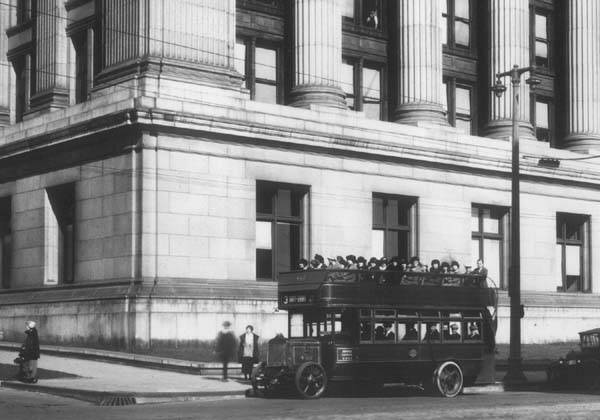 At the time, the gasoline powered coaches were used to supplement the streetcars lines and provided service where the extension of streetcar lines would not be economically feasible. 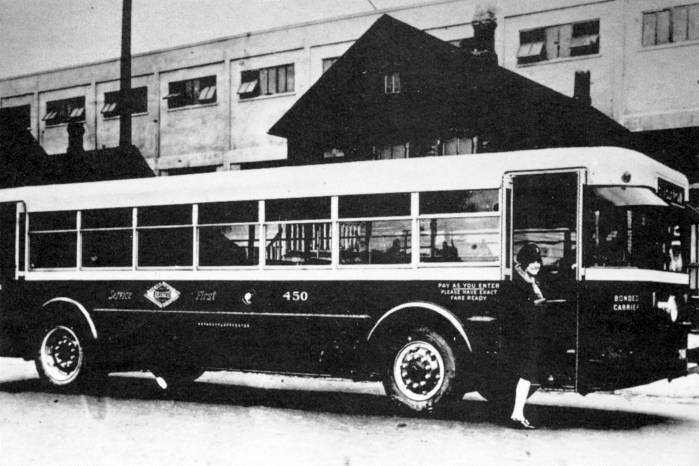 Gasoline engines remained the choice for TM's motor coach fleet until 1950, when successor TMER&T began purchasing diesel coaches. 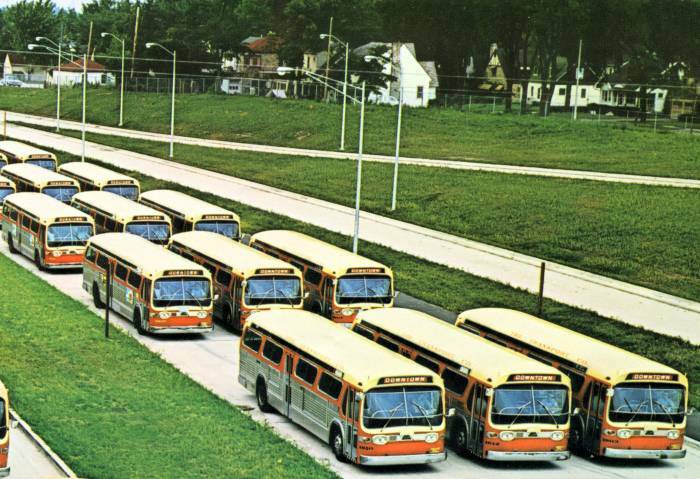 Oakland Car Station had the distinction of becoming Milwaukee's first "all diesel storage facility." 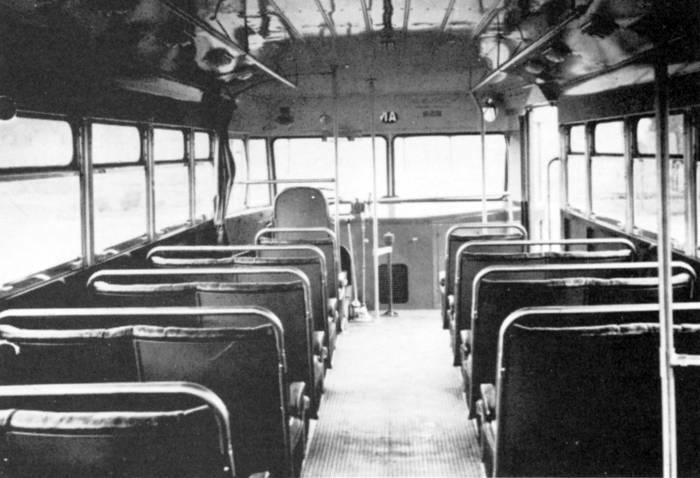 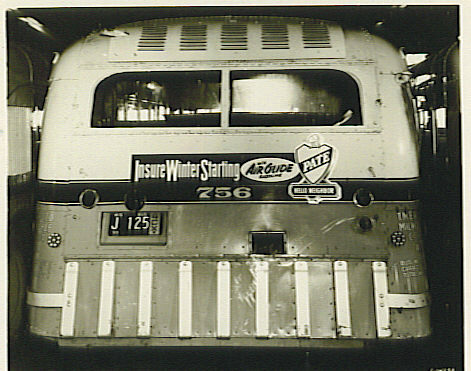 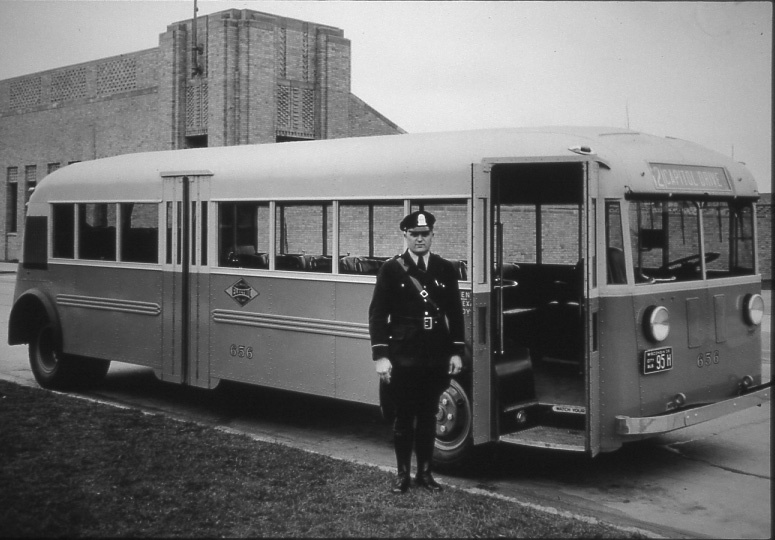 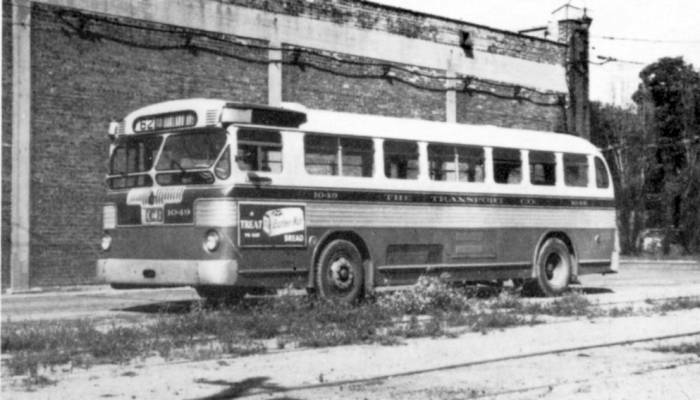 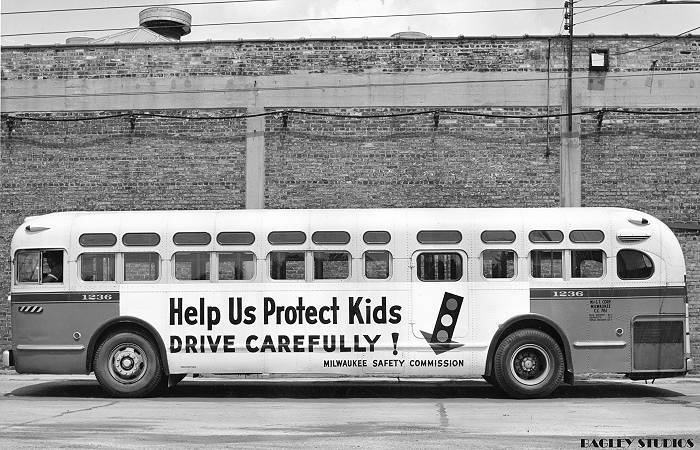 Gasoline powered coaches continued to serve in Milwaukee until 1967. 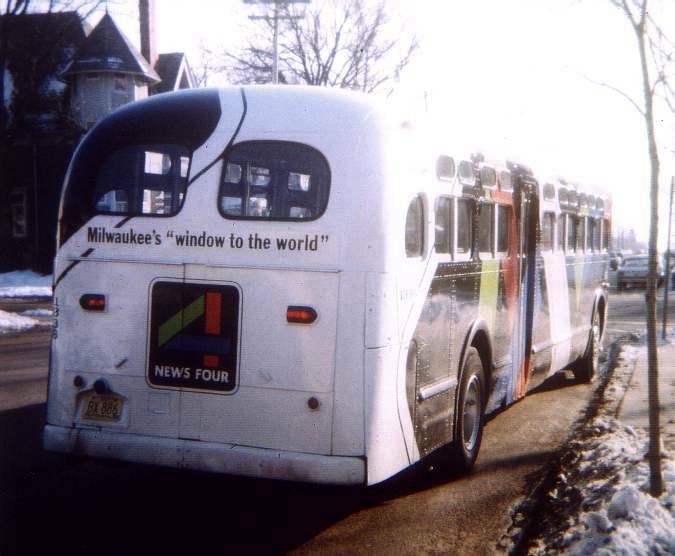 Near North 35th Street and Fond du Lac Avenue. 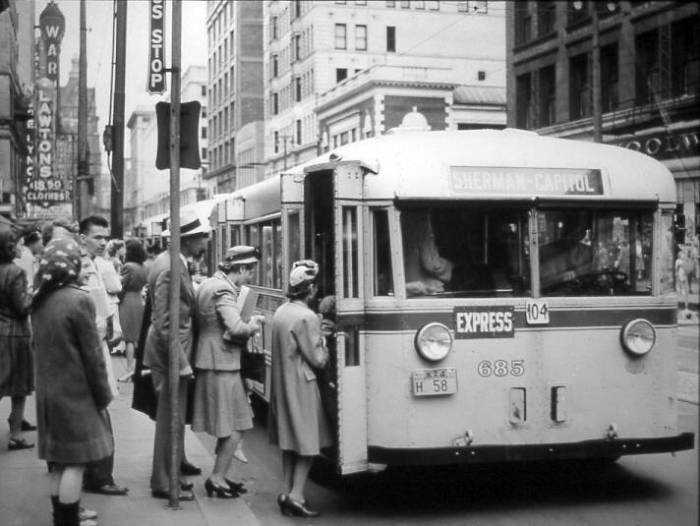 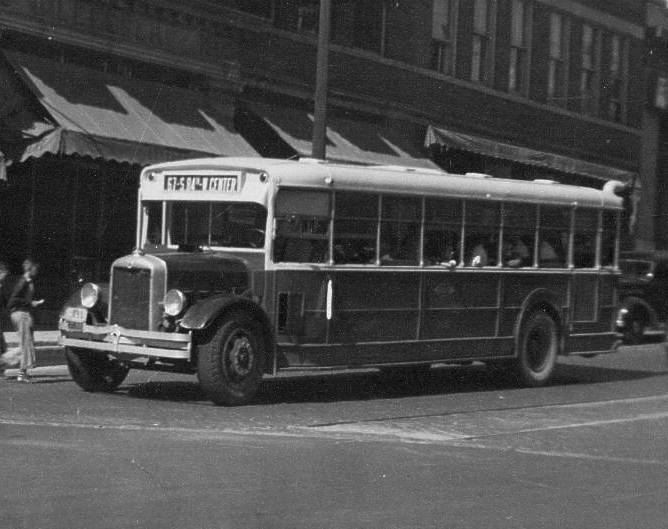 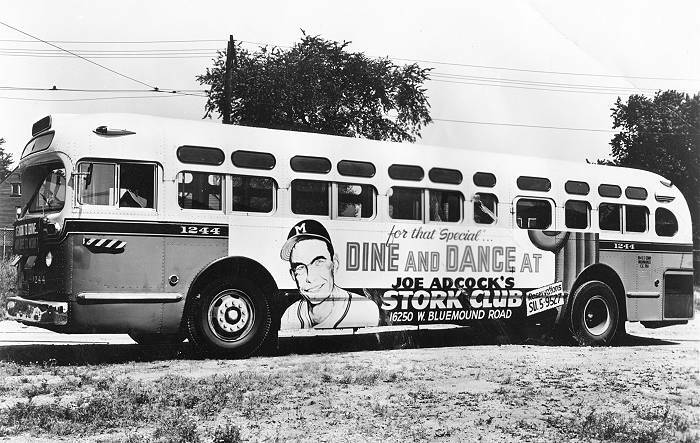 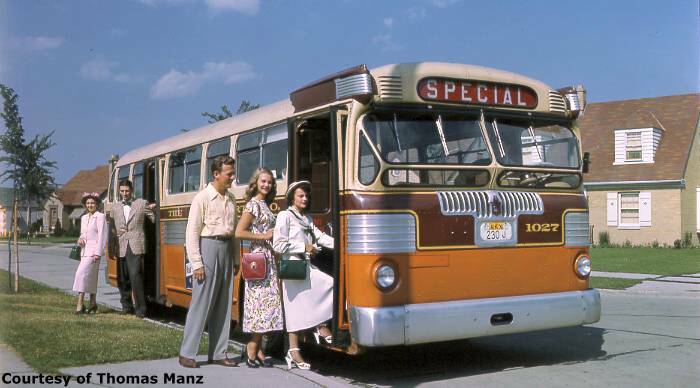 "Slopeback" Twin Coach downtown, 1943. 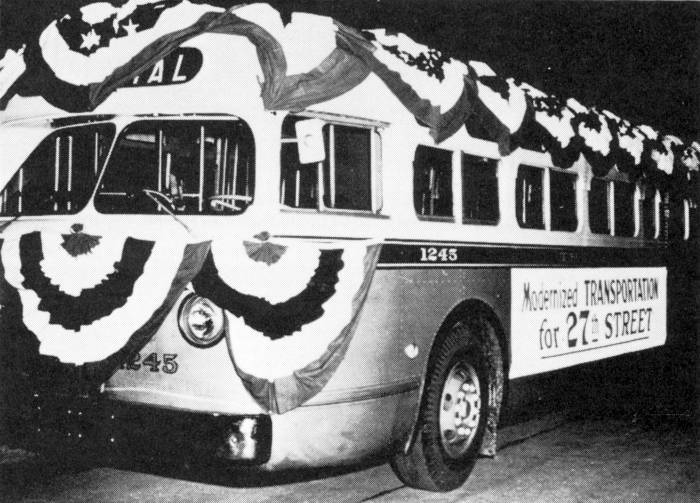 TDH-4511 "1245 celebrating the "bustitution" of Route 27. 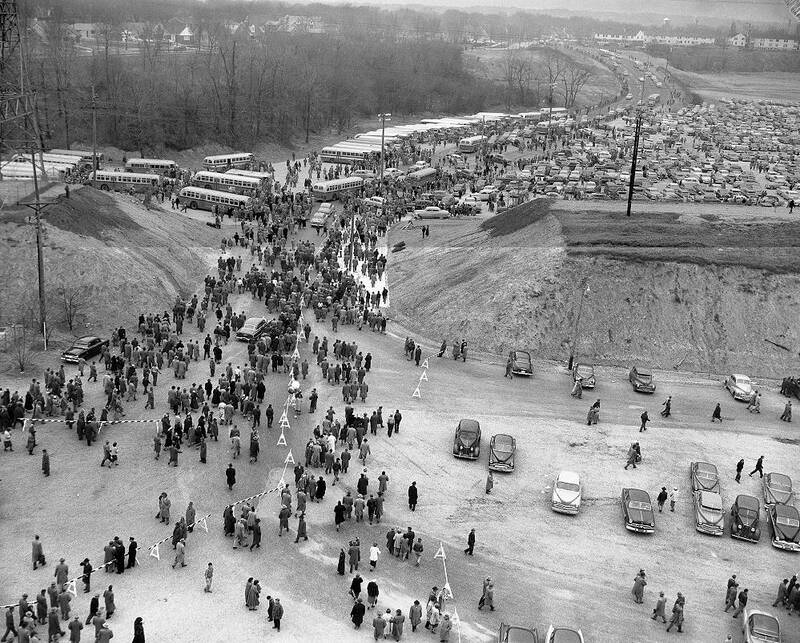 When County Stadium was built, former Rapid Transit embankment was breeched to provide access. 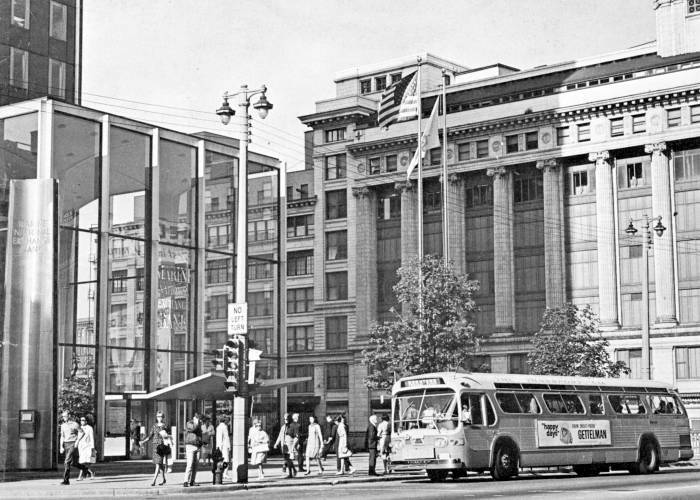 Two GMC "Old Looks" on Wisconsin Avenue, 1954. 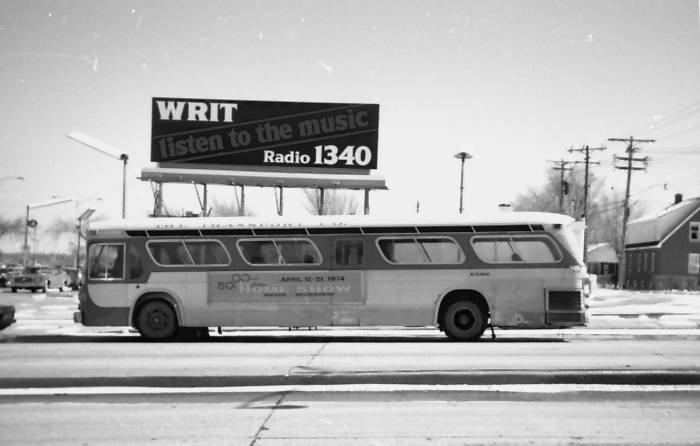 Southbound #1421, Route 35, across from Fond du Lac Station. 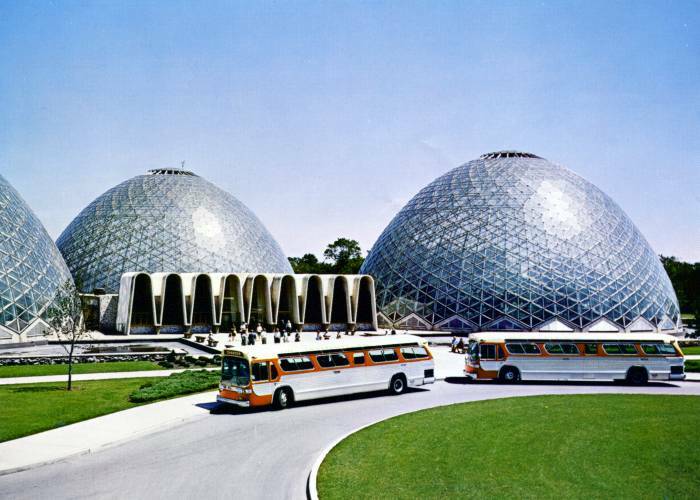 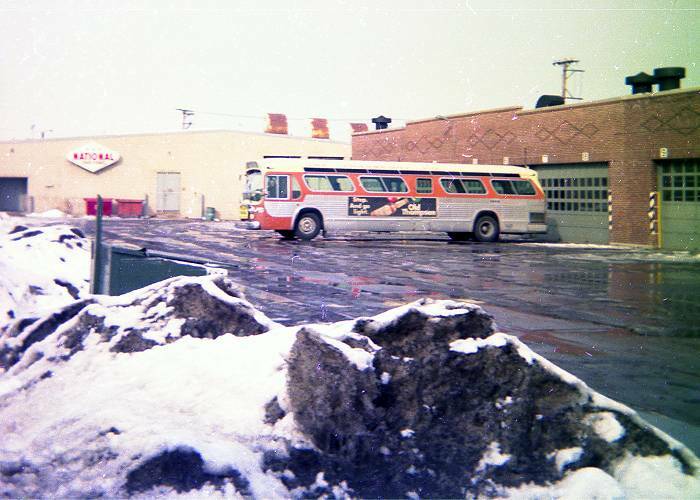 Two "Fishbowls on the west side of Fond du Lac Car Station, early 1974. 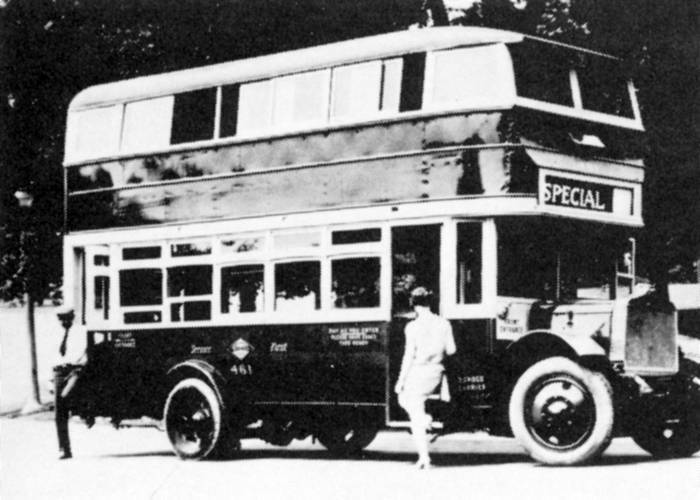 Sightseeing coach 1761 & service coach 1817. 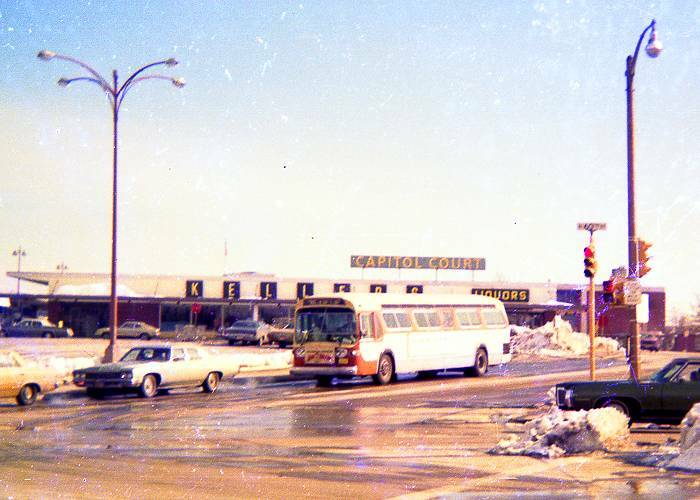 Fond du Lac Car Station, 1975. 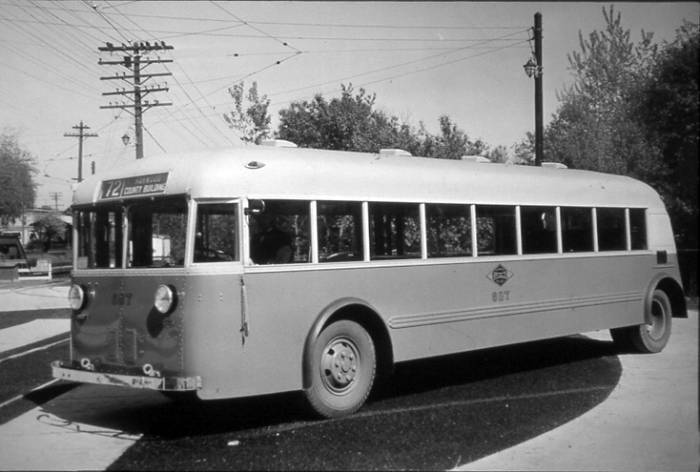 Northbound Route 76 coach at N, 60th Street & West Hope Avenue. 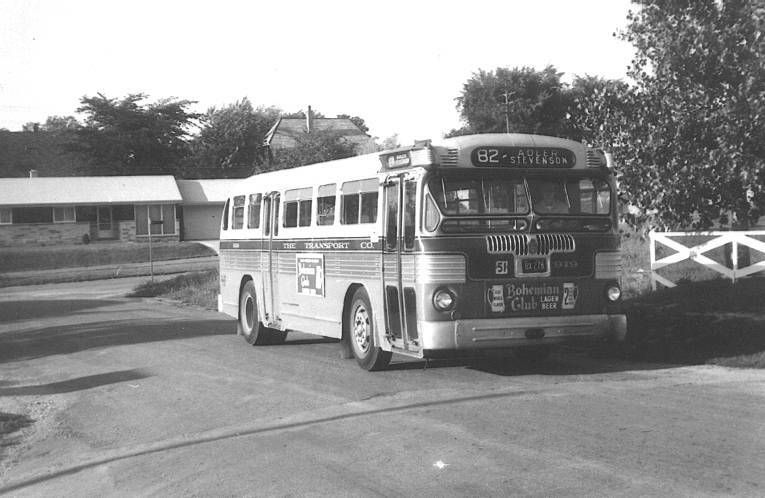 Southbound Route 76 at N. 60th Street & W. Capitol Parkway. 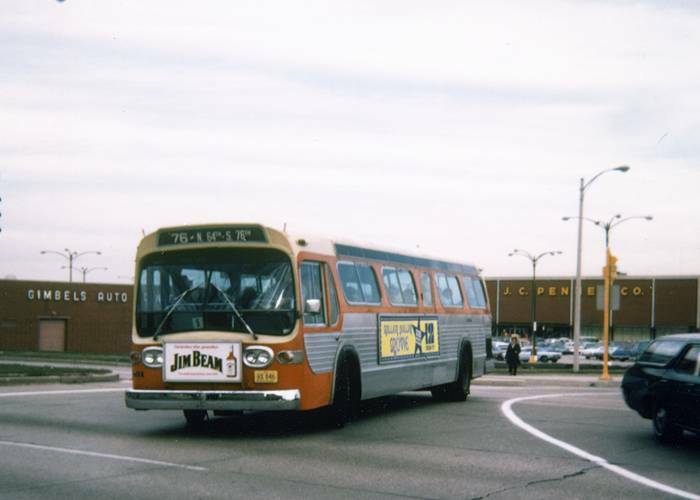 "Pull-in" about to enter Fond du Lac Car Station, 1974. 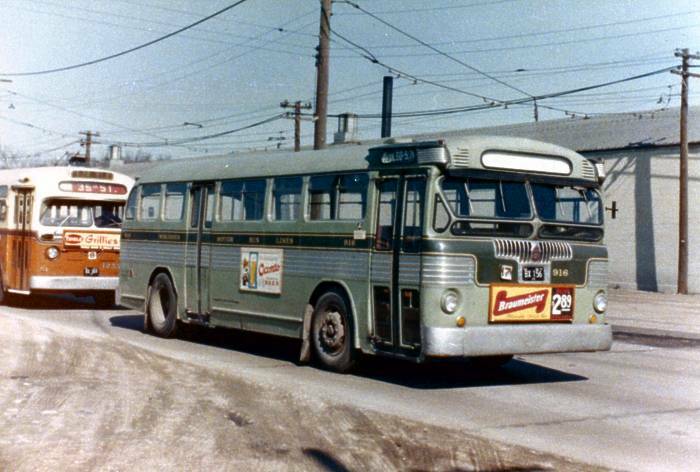 Outbound Route 23, Fond du Lac Avenue, below North 35th Street. 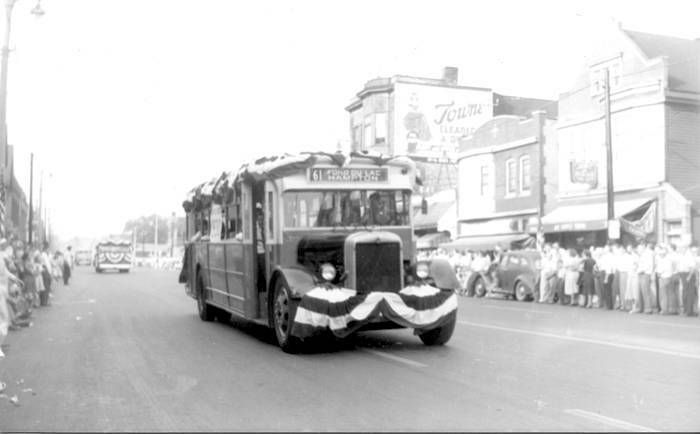 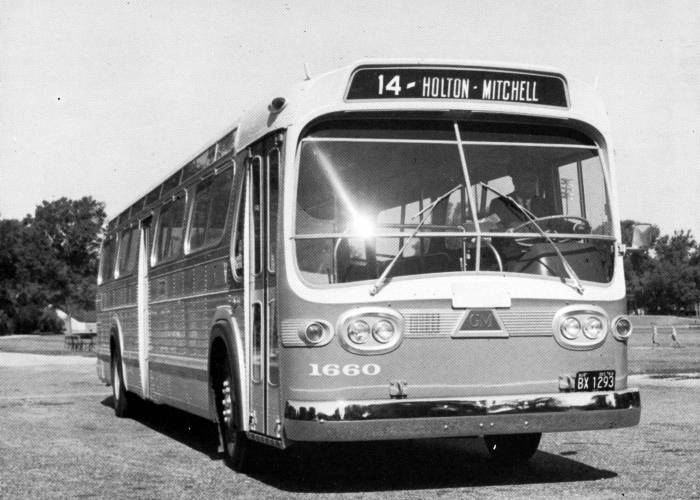 Motor coach 551, in a parade. 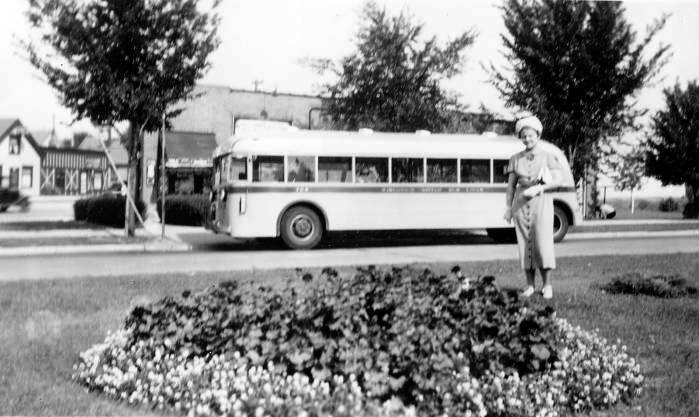 Note Twin Coach in the background. 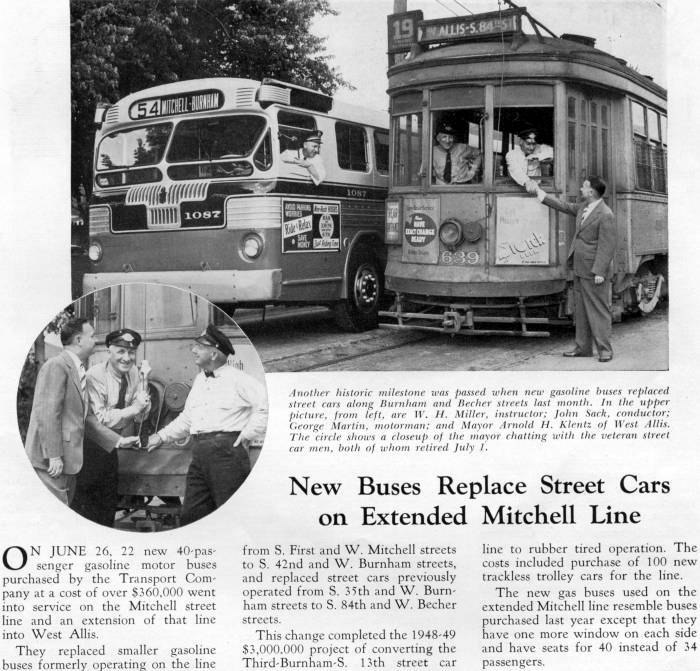 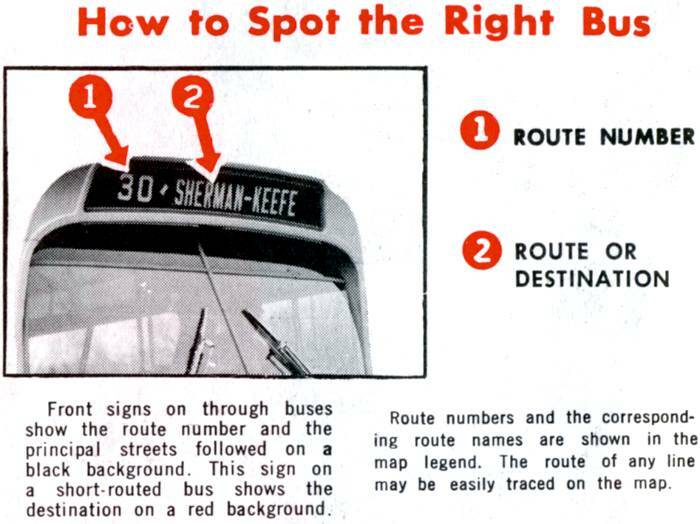 "Rail & Wire" article on the conversion of a Route 19 segment to motor coach. 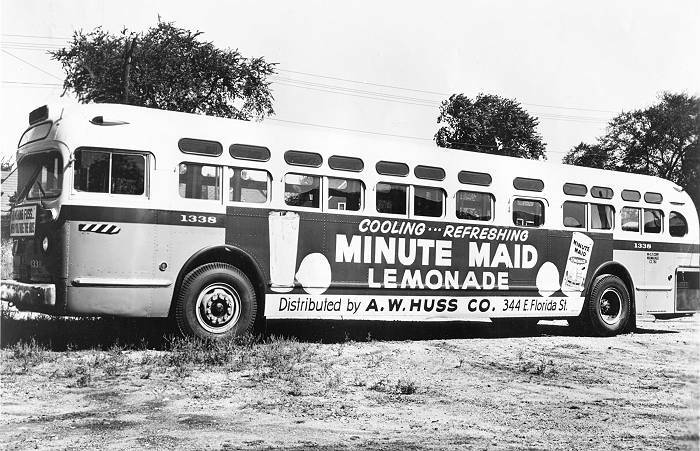 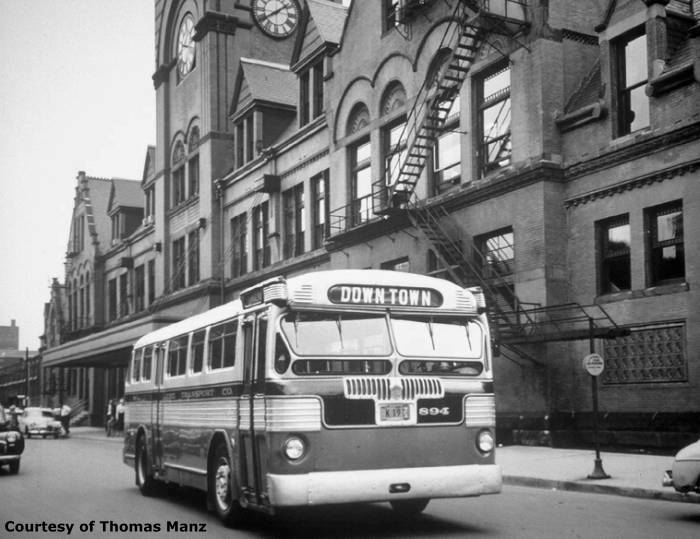 Thomas Manz provided this outstanding publicity shot of Twin Coach #1074. 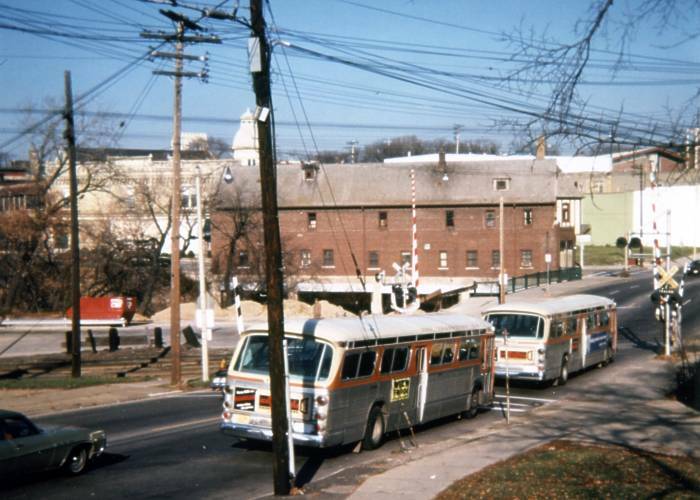 Two M&ST Twin Coaches in a sea of parked buses, County Stadium, circa 1954. 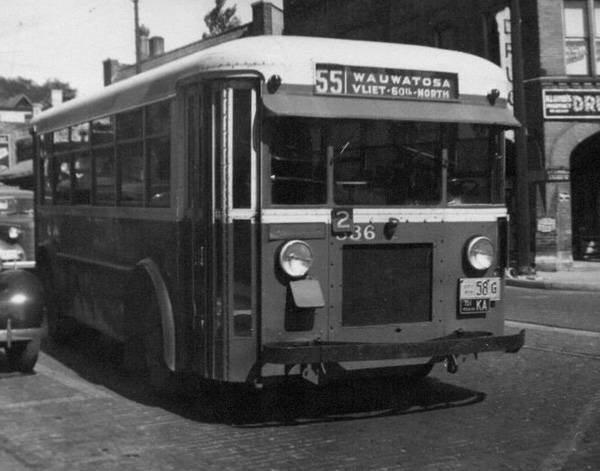 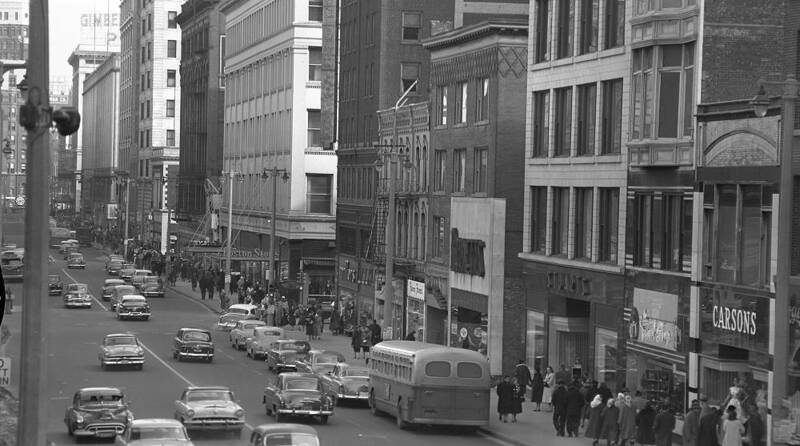 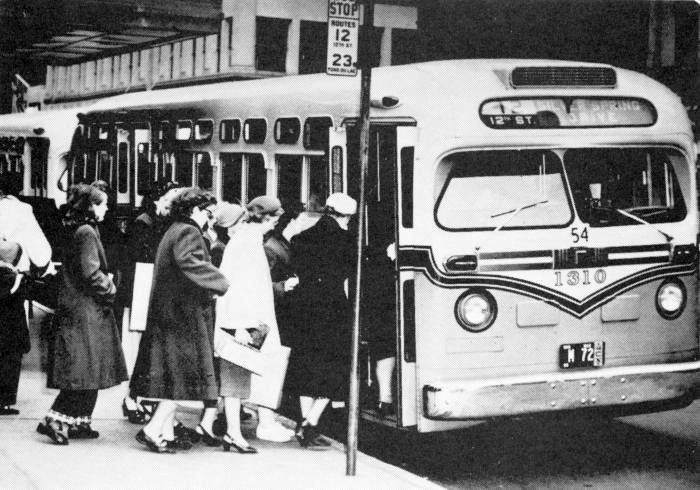 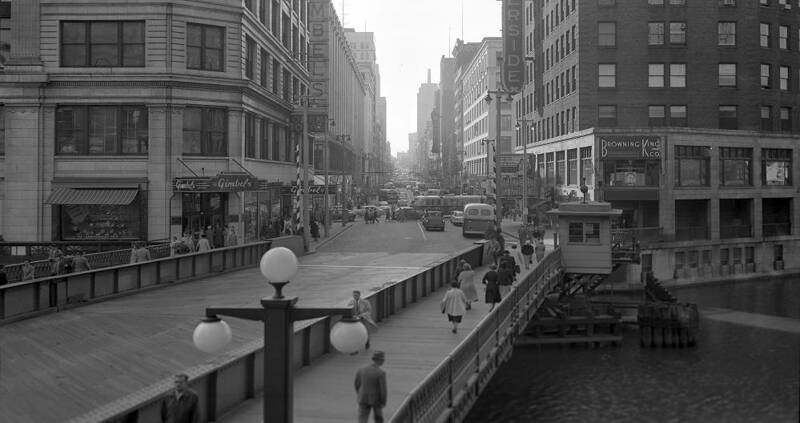 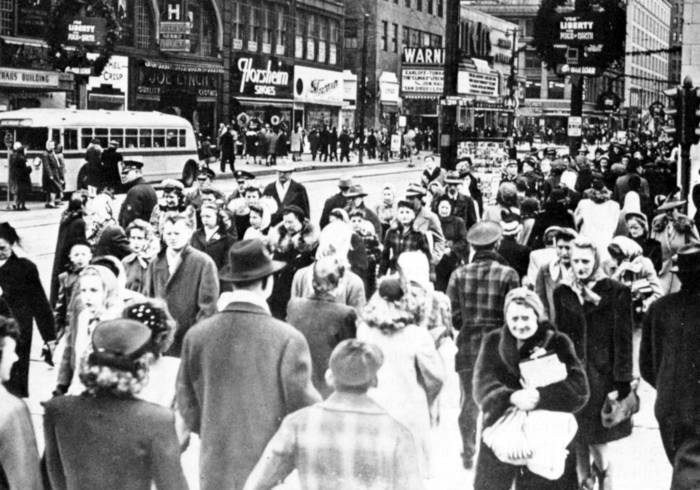 Wisconsin Avenue seems to be ruled by GMC coaches in this 1954 view. 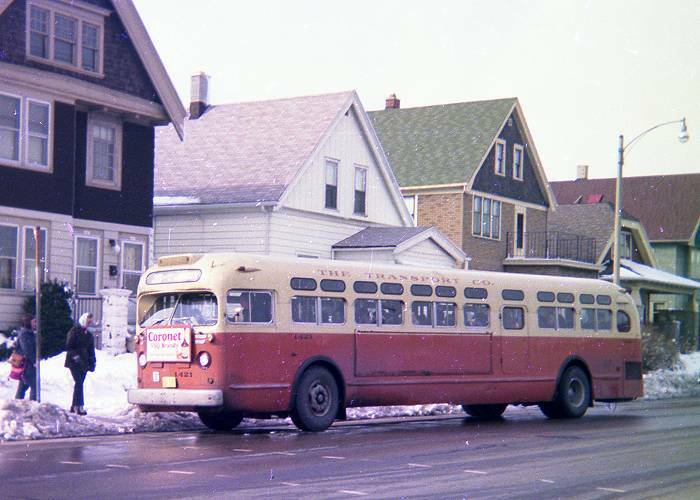 Pullman trolley on Plankinton. 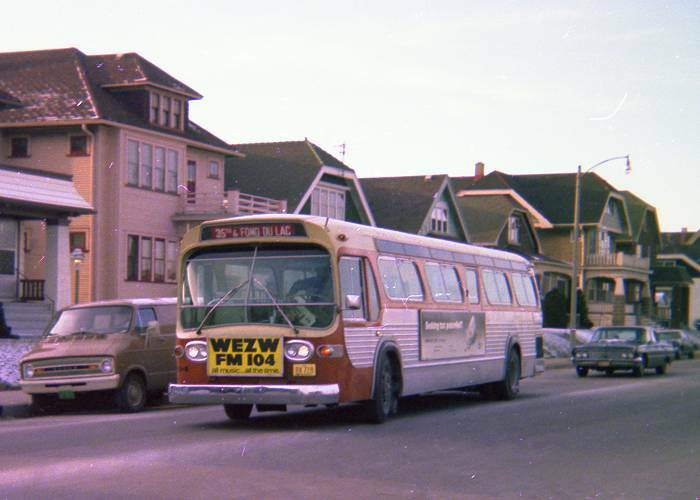 1336 at Treasure Island, N. 124th & Capitol Drive, Route 62 western terminal, 1974. 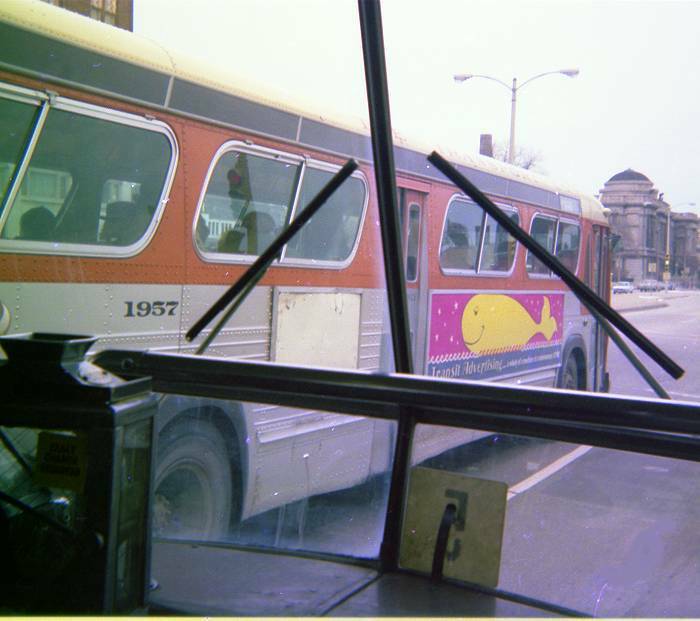 1336 at the eastern end of Route 62, on Maryland Avenue, 1974. 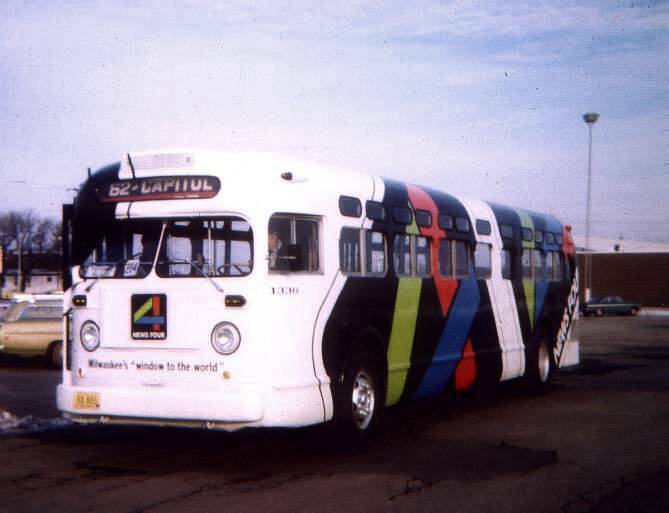 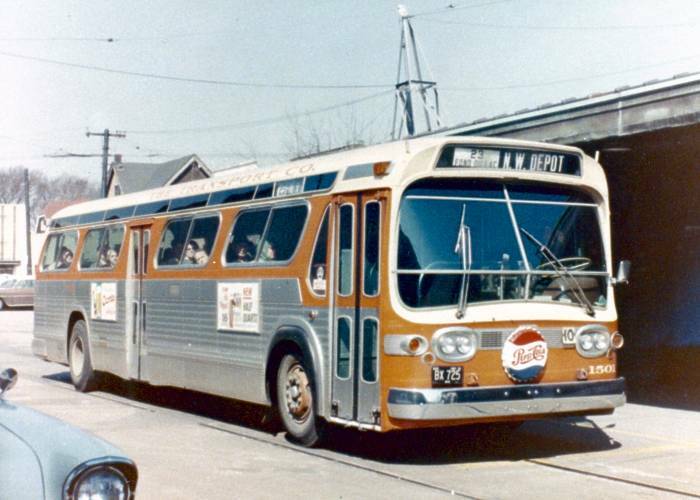 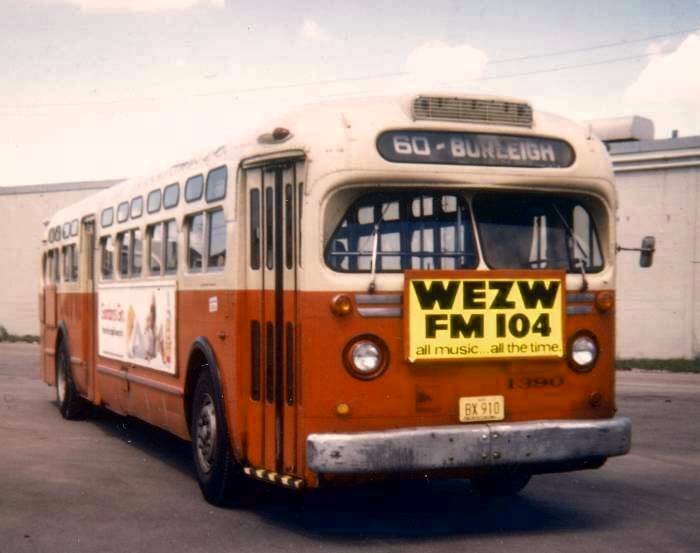 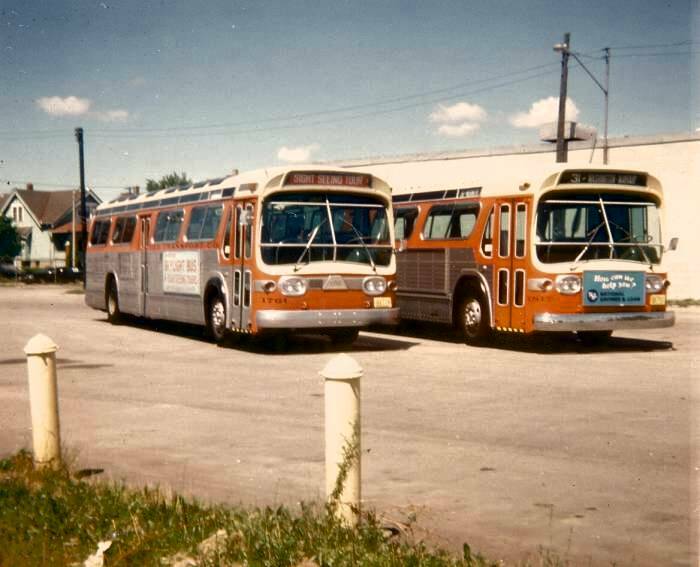 1390 at Fond du Lac Car Station, summer of 1975, just before MCTS took over operations. 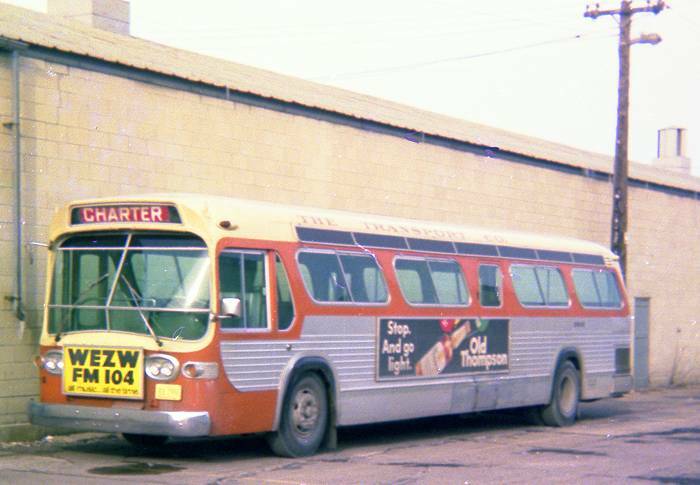 Northbound Route 76 TDH 5301 on North 60th Street at West Capitol Drive, early 1974. 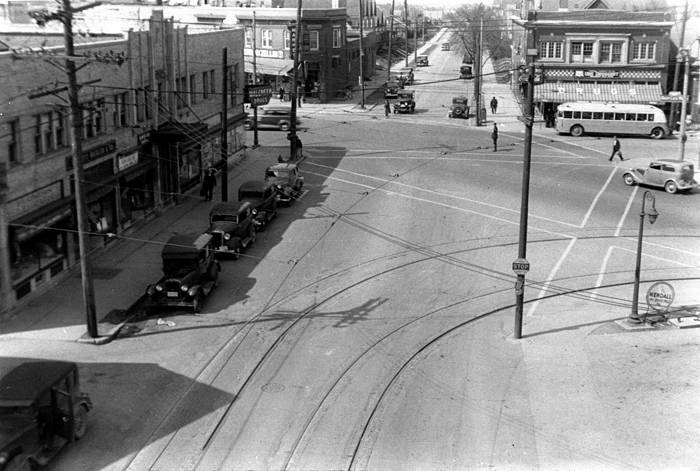 N. 60th &Capitol Parkway, taken from 4059 N. 60th Street. 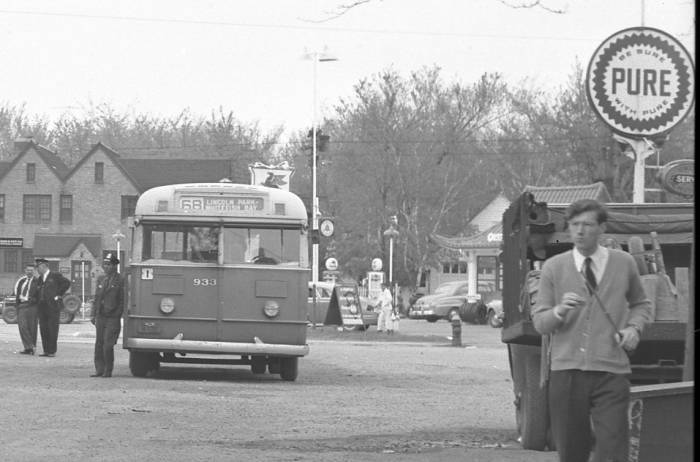 TDH-5303 at Fonde du Lac Car Station, 1974. 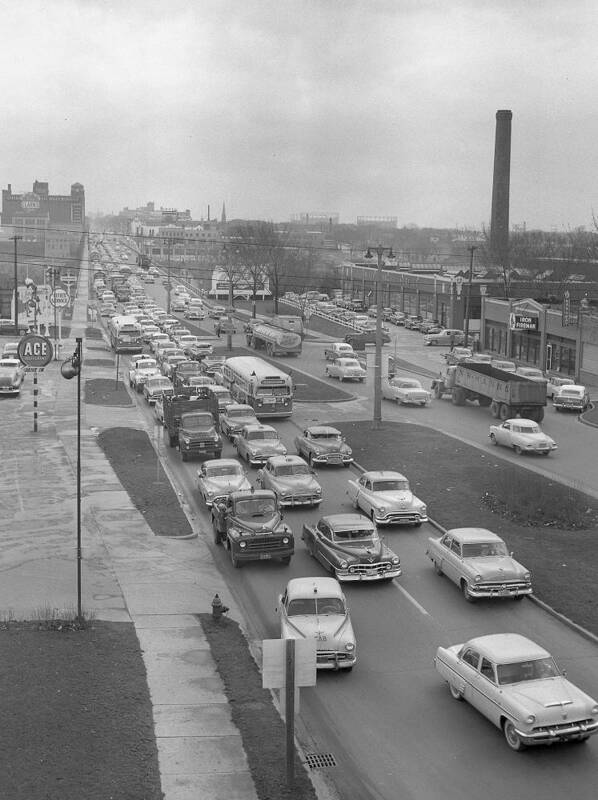 Eastbound on Wisconsin Avenue, just west of the Main Public Library. 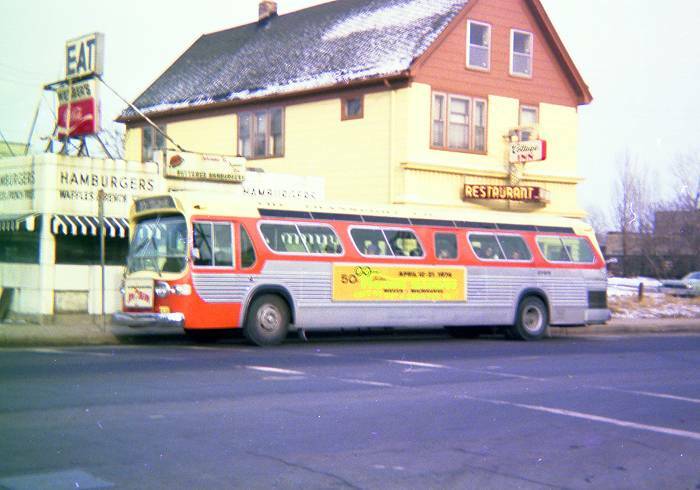 "Pull-out" getting ready for service, Fond du Lac Station, 1974. 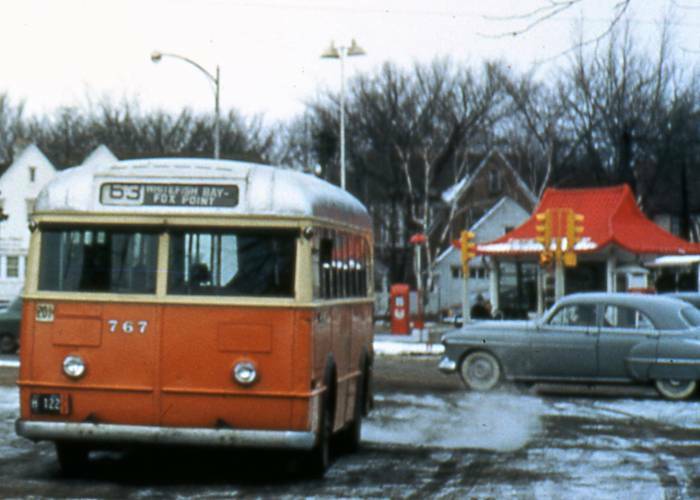 From a slide by the Late Gordon Lloyd, Ford coach #767, Whitefish Bay. 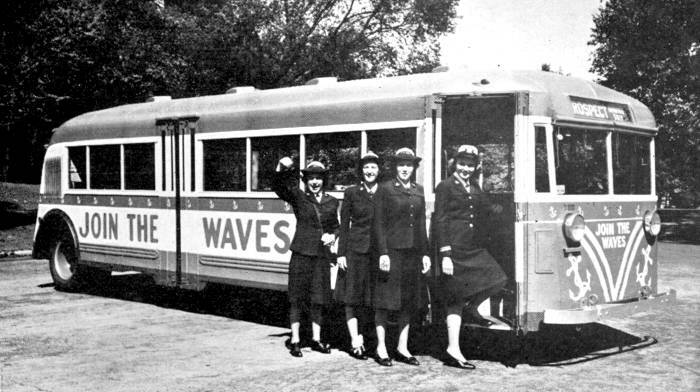 "Slopeback" Twin engaged in World War II recruiting for the WAVES. 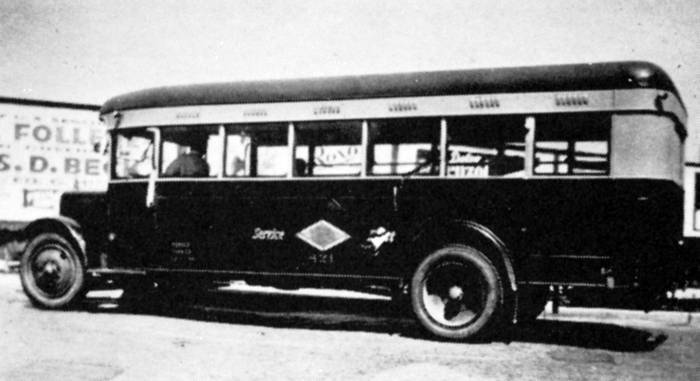 A Twin Coach and a GMC. 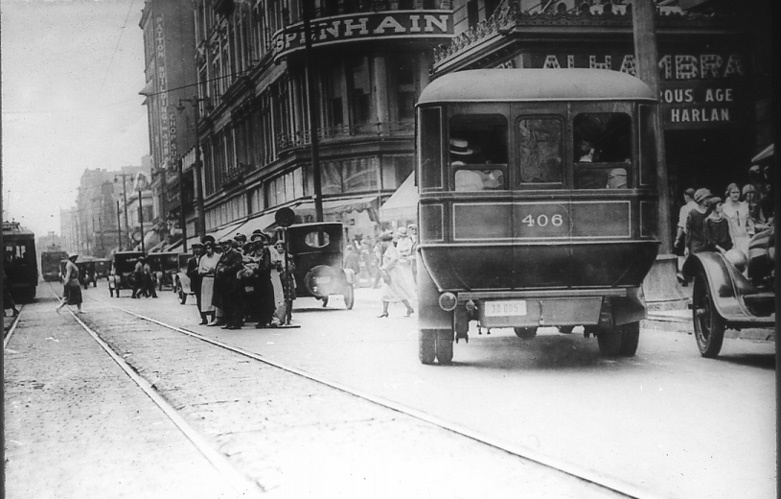 Both were gasoline powered. 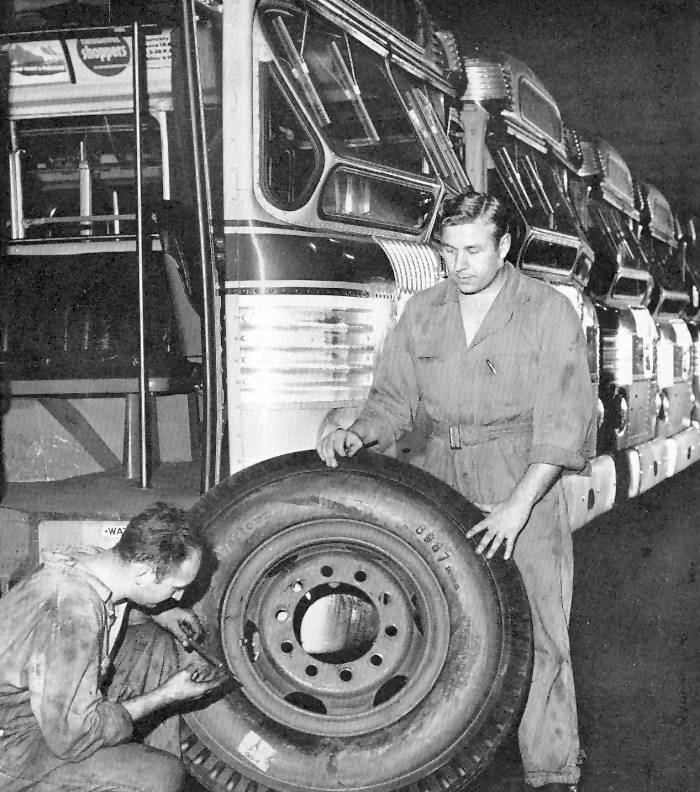 Maintenance personnel checking a bus tire at a Car Station. 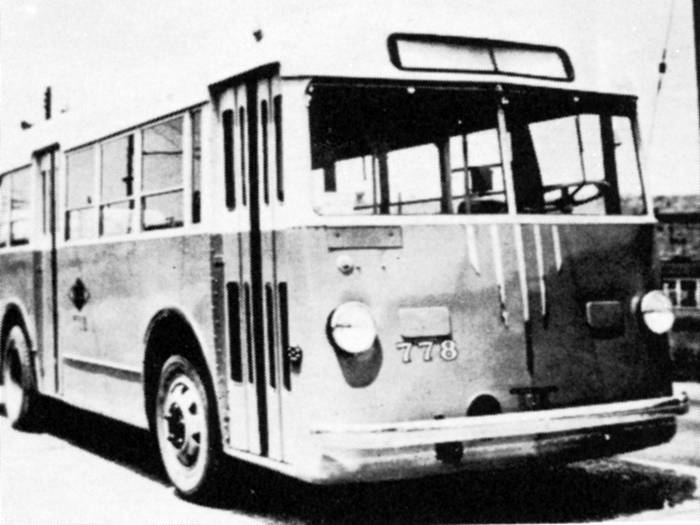 Twin Coach #894, coutesy of Thomas Manz. 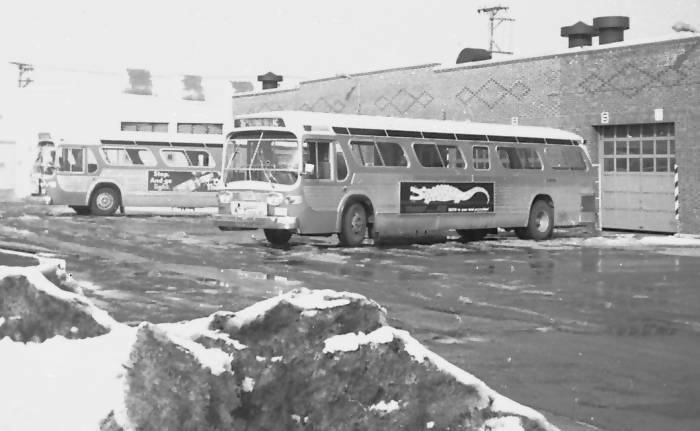 Bagley Studios photo of coach 1236 @ Fond du Lac Car Station. 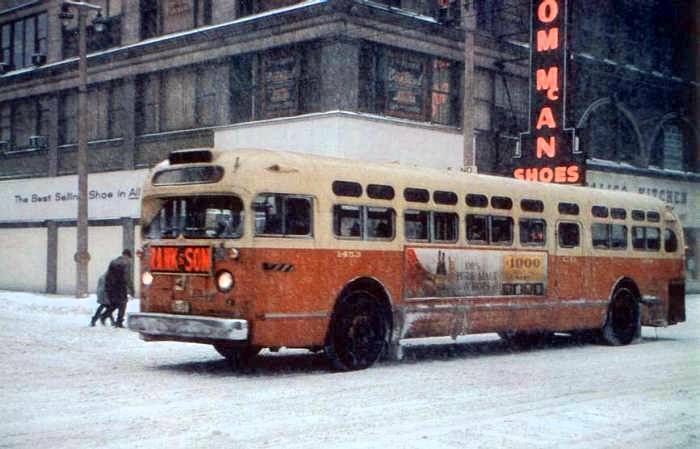 M&ST GMC "Old Looks" in " stadium service" on W. Wisconsin Avenue, 1954. 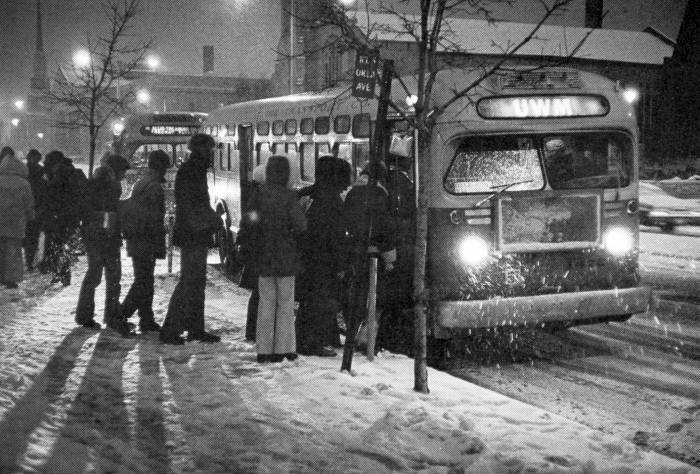 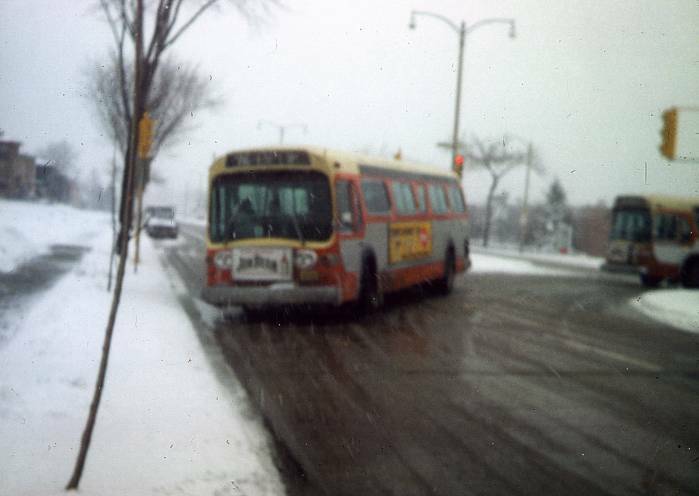 1472 on a UWM run, probably on Kenwood Boulevard. 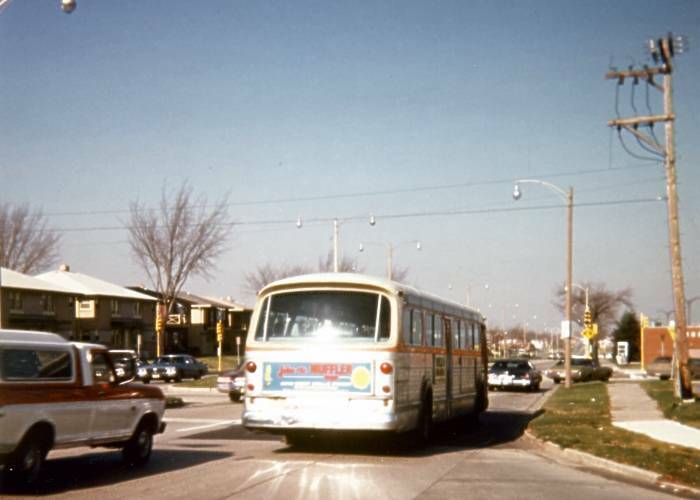 Two "Fishbowls" inbound on Harwood Avenue, Wauwatosa, 1974..
Northbound Route 76 about to turn east into Capitol Court shopping center. 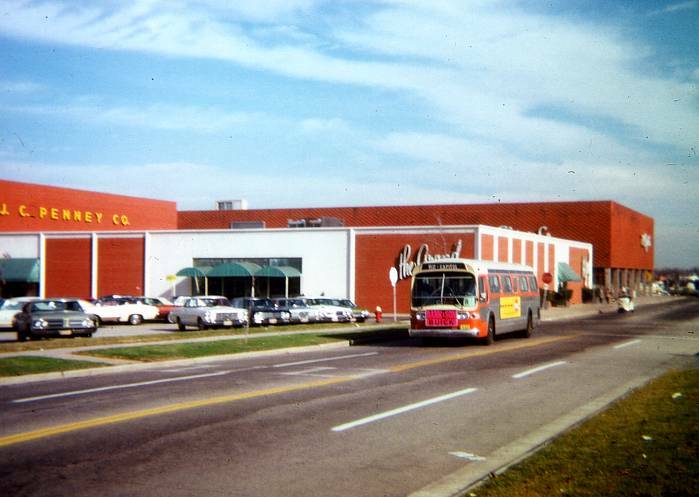 Mid 1970s. 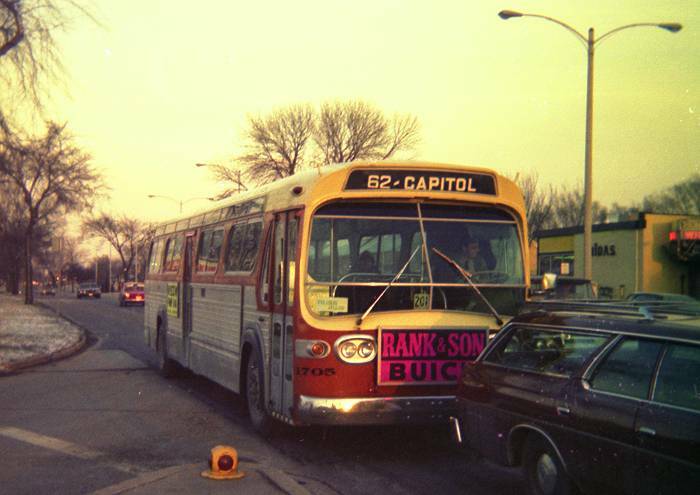 Short turn Route 62 bus on Capitol Pwky will turn south on 60th, then east on Capitol Drive. 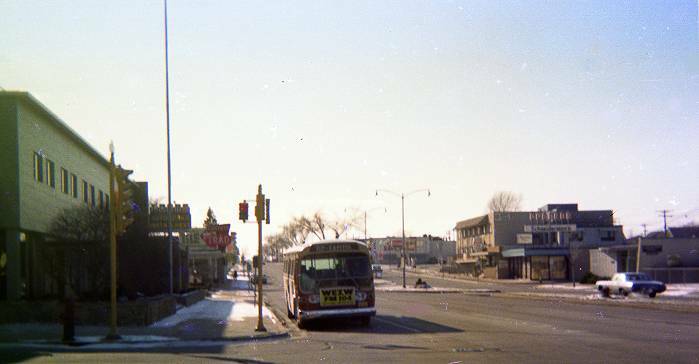 Eastbound Route 62 at North 60th & West Capitol Drive, circa 1975. 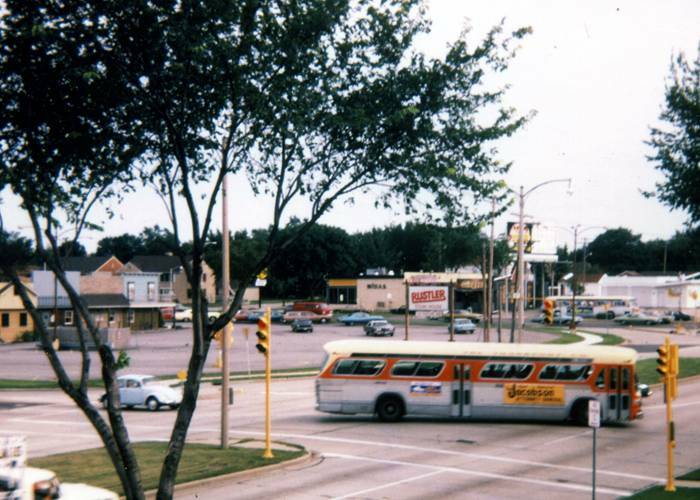 A southbound Route 76 & short turn Route 62 at 60th & Capitol Parkway, 1975. 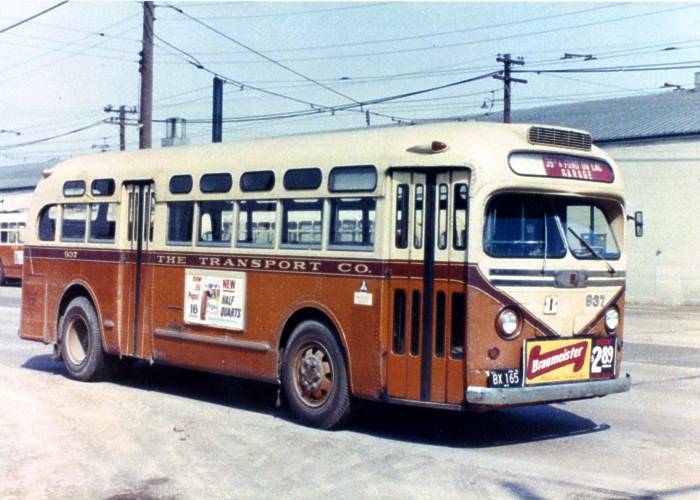 Westbound coach #1705 at N. 60th Street.